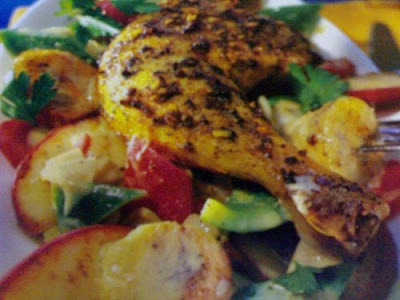 Marinate chicken leg with curry powder, chili powder, and pepper for at least 30 minutes. Set aside. Place chopped onion-ginger-garlic, apples, and bananas into a deep microwave oven. Place the marinated chicken leg on top. Bake in microwave oven for 15-20 minutes. Take out, add broth and yogurt and stew for another 15-20 minutes.